Many substances are toxic and should be removed from a cat’s fur immediately to prevent the cat from licking them off and being poisoned, or suffering skin irritation and damage. Some substances may also be absorbed through the skin or inhaled, so quick removal is critical. Substances that commonly get stuck in cat fur include glue (or glue traps), paint, oil, varnish, gasoline, tar, and grease. These substances can all be removed using the same method. In the case of toxic substances, wear gloves while handling the cat and remove any contaminated items, such as the collar. Then proceed with the following steps. Step 1: If the substance is something sticky such as paint, tar, glue, or varnish that has hardened, the easiest way to get rid of it is to carefully trim away the affected fur (some experts also recommend this step to remove non-sticky substances from coats that are particularly long or thick). If there is any remaining residue, proceed to steps 2 to 4. To remove greasy or oily substances (or to remove sticky substances without trimming the fur), begin with Step 2. Step 2: Cover the affected area with an edible oil such as vegetable-based cooking oil or butter – this helps loosen the substance for removal. Don’t use oils such as tea tree oil, citrus oil, or eucalyptus oil, which are toxic to cats. Also, don’t use insecticidal shampoos (they may interact with the substance on the fur) or solvents such as gasoline, kerosene, acetone, or paint thinner, which can cause serious harm to the cat. 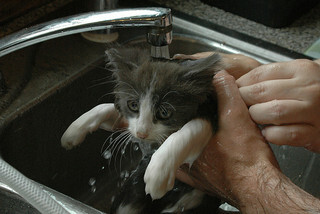 Step 3: Bathe the cat in warm soapy water. Use a mild liquid dishwashing detergent such as Dawn (don’t use detergents meant for dishwashers, as they are too harsh). Wash as many times as necessary to remove all traces of the substance and rinse thoroughly until there is no soap remaining on the fur. Step 4: Becoming chilled after a bath can cause a cat to become ill. Cold is particularly dangerous for elderly cats and young kittens, so it is important to dry the cat as much as possible and place her in a warm space to recover. Use a towel to blot and gently rub most of the water from the cat’s fur. Then wrap the cat in a warm dry towel and keep her in a warm room or near a heat source such as a space heater until she is dry. Many substances, particularly petroleum products, can be deadly, especially if ingested. If no signs of illness develop within 12 hours of exposure, the cat has probably not been poisoned, but observing the cat for 24 hours is recommended. Do not induce vomiting with petroleum product poisoning, as this can burn the esophagus and cause the substance to be inhaled into the lungs, leading to a serious illness called aspiration pneumonia. Just provide water for the cat to drink if she is able to and seek medical attention immediately. Drs. Foster & Smith. (2010).“How to Remove Tar & Paint from Dogs & Cats.” PetEducation.com. Feline Advisory Bureau. (n.d.). “Poisons in the Home.” FABCats.org. PetPlace Veterinarians. (2010). “My Cat is Covered in Paint or Tar or Oil.” PetPlace.com. Ruben, D., Dr. (2010). “Gasoline and Petroleum Toxicity in Cats.” PetPlace.com. Tittle Moore, C. (1997). “General Cat Care.” Fanciers.com. University Animal Hospital. (2009). “Toxic Hazards in Cats.” UniversityVet.com.